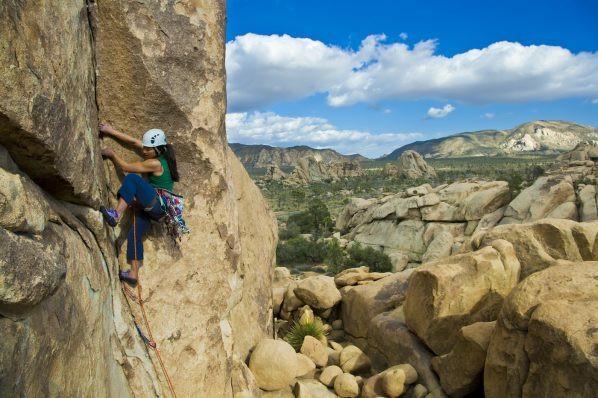 Learning how to lead climb is to engage in one of the most intense and rewarding forms of climbing. You are responsible for protecting yourself as you climb higher – a nerve-wracking yet exhilarating prospect. As you climb above your protection, the possibility of falling is real. Lead climbing takes you closer to the edge, which makes it thrilling, and worthy of your time and effort. 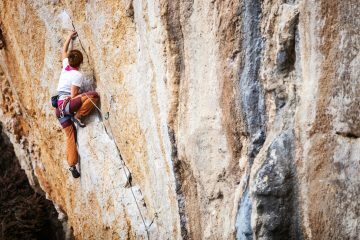 Countless climbers have been on The Sharp End, and learning how to control fear is a major part of climbing. But lead climbing can be dangerous if you don’t know what you’re doing, as there are many technical aspects to master. 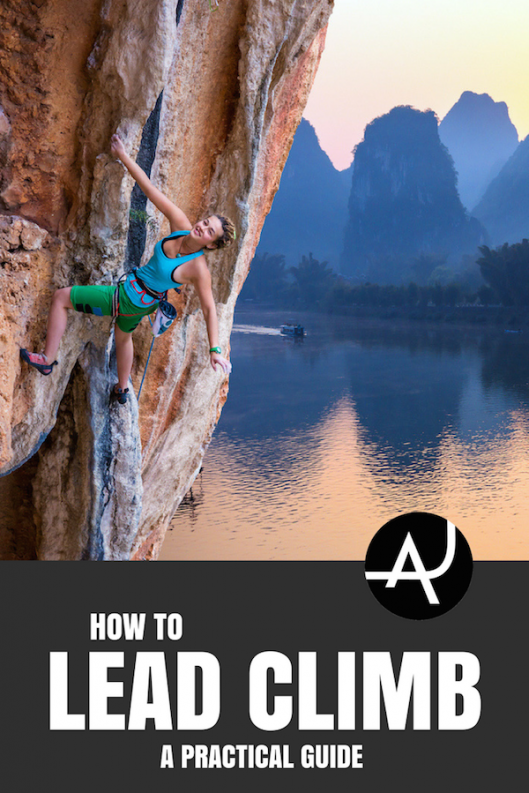 In this post, we give you some pointers on how to lead climb. When you step up to lead climb, you carry all the gear you need to protect yourself from a fall. This differs from top-roping, where the rope is already running through an anchor at the top of the route to the climber. (In top-roping, you don’t really fall, but merely dangle on the rope.) The equipment is the same – you wear a harness to tie into the rope, which runs to a harness on your belayer, the person responsible for catching your fall. The protective gear you take will depend on whether the climb is a bolted sport climb, or a traditional (trad) climb. This is the form of climbing that most climbers do. A sport climb is a line of bolts up a rock face, usually a couple of meters apart, put up by one of the many developers who love establishing new climbs. 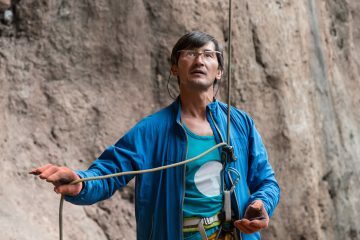 Sport climbers only need to carry quickdraws – two carabiners attached via a piece of webbing or a sling – to lead climb. As you climb, you clip the top carabiner to the bolt, and then clip the rope through the bottom carabiner. If you fall, your belayer will catch you as the rope weights the highest bolt that you’ve clipped. You’ll need at least as many quickdraws as there are bolts, as well as two extra to clip the two anchor bolts. Climbing a face that has no bolts? Trad climbing means carrying up and placing protective gear as you climb. There are many different types of trad protection, but the two main ones are camming devices, or cams, and wires. Cams are spring-loaded devices with a trigger and four lobes, and are placed inside parallel cracks. A fall on a cam will attempt to open the lobes, but, if well placed, the rock keeps the lobes closed and holds the fall. Wires, also called nuts or stoppers, are trapezoid-shaped devices that are wedged inside natural nooks and crevices in the rock. Like sport climbing, you also need quickdraws, clipping the top carabiner into the trad gear you place, and the rope through the bottom carabiner. The security of a trad placement will depend on the solidity of the rock and the placement itself. Trad climbing is considered a bolder form of climbing, as you cannot rely on the security of a pre-placed bolt. Properly placed trad gear in solid rock, however, is as secure as protection bolts. If you fall while leading, you will fall more than twice the length of the distance to your last protection piece. For example, if you fall six feet (two meters) above your piece, then you will fall 12 feet (four meters) before the rope comes taut, and then a bit more as the rope stretches and absorbs the force. For many, this is what climbing is all about: being in the moment, controlling your fear, tackling the problems that the rock presents, and making judgment calls as to what to do. Go for it? Down-climb? Cigarette break? 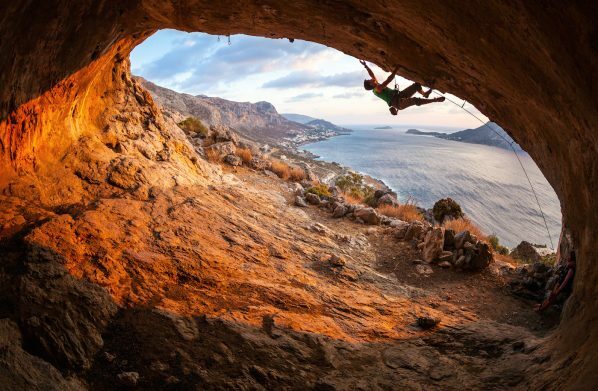 This is part of what makes lead climbing so exciting. Climbers also find it useful to practice falling, not only to calm the nerves, but also to get used to the movement, and the landing. If you’re on a steep overhang, chances are you will fly through the air and not hit a thing. But on a slab, it pays to keep your feet, bend your knees, and land on the rock as softly as possible. When falling, you should be aware of objective hazards, such as ledge systems that you could hit on your way down. But if the objective hazard is low and you get used to it, you’ll discover that falling is really not as terrifying as it seems. If you’re lead climbing above your protection and the rope is wrapped behind your leg, it is a dangerous recipe for an inverted fall. This can happen if you step to the side as you climb, trailing the rope in such a way that it sits behind your ankle. Falling like this will often see the rope trip you, flipping you upside-down (good image of how this happens halfway down the page). If the rope is behind your leg, calmly flip it back in front of you. If you’re hanging on for dear life, then clipping a bolt or piece of trad gear can be a daunting prospect. Clipping efficiently and quickly will help your lead climbing immensely. Check out the stances and the holds around a bolt. Sometimes the best place to clip is with the bolt at your waist, rather than at the top of your reach – though it may feel counterintuitive to climb higher when you’re scared. Also, clipping with a straight arm, while not always possible, will use less energy. There are generally two ways to clip – pinch-clipping and snap-clipping – and what you will use will depend on which hand is easier to free, and which way the gate on the carabiner is facing. Reach down and take the rope between your thumb and forefinger, pulling it up to the quickdraw. As you go to clip the rope into the lower carabiner, take your thumb to the side of the carabiner opposite the gate. This will steady the quickdraw, while the rope is draped over your forefinger. As you “pinch” the carabiner, use your forefinger to push the rope into the carabiner. Again, reach down and grab the rope between the forefinger and thumb. As you pull the rope up to the quickdraw, put our middle finger in the carabiner to steady it. Now push the rope into the carabiner with your thumb, rolling it over as you “snap” the rope into the quickdraw. 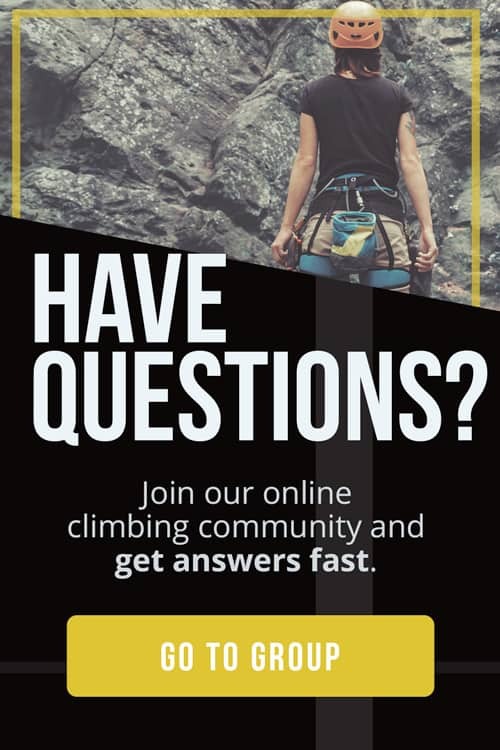 Climbing.com provides some handy drawings of pinch- and snap-clipping. Two things to be wary of and to avoid are back-clipping and z-clipping. After clipping your rope through a quickdraw, the rope should run up through the quickdraw from the back side of the carabiner, rather than the side facing you. Clipping it the other way could potentially lead to a fall where the rope unclips itself from the quickdraw. If you grab the rope from below a piece of protection and clip it into a higher piece, you’ll create a ’Z’ with the rope, running from the top piece, down to a piece below, and then up to your harness. It creates such forceful rope drag that you won’t be able to move any higher. This can easily happen if protection is placed very close together, and you accidently grab the rope from below the last piece of clipped protection, instead of from above it. Make sure you know what you’re doing when you get to the top of a climb. Many accidents have occurred after a lack of communication or understanding between the leader and the belayer about getting down. 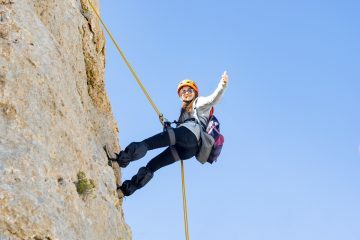 Typically, when you get to the top of a sport climb, you can clip quickdraws into a bolted anchor – usually two bolts – clip the rope through them both, and then be lowered back down. If you’re cleaning the quickdraws off the route, then you’ll need to make yourself secure in the anchor when you get to the top, before re-threading your rope through the anchor. You can then clean the quickdraws as you are lowered down (sometimes you’ll want to rappel down, rather than be lowered). Many descents off trad climbs also involve bolted anchors, although it is just as common to have a walk-off descent. If there are no bolted anchors, you may need to build a strong, equalized trad anchor to bring up a second. Make sure you know what the anchor set-up is and how to get down, before you head up. Transitioning from top-roping to leading can be nerve-racking. It will help to start on a climb you have already top-roped several times, one you are unlikely to fall on, and use it to familiarize yourself with pinch- and snap-clipping quickdraws or, if it’s a trad route, placing trad protection. Being confident with placing and clipping protection will make a huge difference once you graduate to harder climbs, where there is a greater chance of falling. If you want to lead a trad climb, spend a lot of time placing and removing gear with an experienced trad climber who can explain what makes a good placement, and what makes a poor, potentially dangerous one. Many gyms offer lead climbing courses, where you can learn the intricacies of lead climbing under the competent supervision of gym staff. 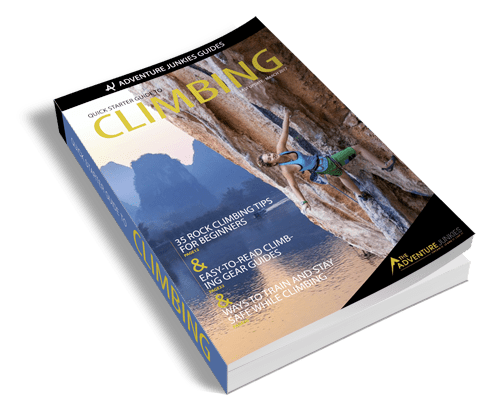 Once you have mastered all the skills you need to lead climb – clipping bolts, avoiding back-clipping, becoming familiar with falling, cleaning routes, and being lowered off – then you’ll be a lot more comfortable going outside and getting on The Sharp End.